One of the Queen rooms at the new Best Western Plus Ambassador Hotel in Orange, NSW. The central-western NSW town of Orange has joined Best Western Hotels & Resorts in the form of the 50-room Best Western Plus Ambassador Orange. Bridging the gap between other BW group properties in Dubbo and Bathurst, the new hotel in Orange joins Best Western from its former identity as the Quality Inn Orange. 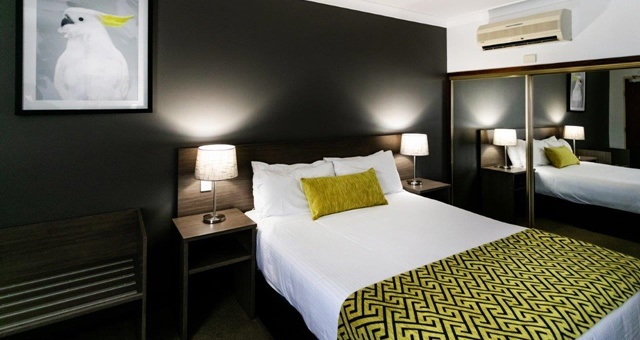 Located at 174 Bathurst Street, Orange, the new hotel features a selection of rooms with both King, Queen and extra single bedded configurations along with King-bedded suites. Guest facilities at the four-star hotel include an outdoor swimming pool, fitness centre, meeting and conference rooms and One Seventy Four Bar & Restaurant – named after the hotel’s address. The hotel is situated near to a variety of local attractions including three 18-hole golf courses, hiking, horse riding stables and hot air ballooning. Orange is also home to the annual F.O.O.D (Food of Orange District) and the Orange Wine Festival. Hotel Manager Ben Cullis said he was pleased to be joining the Best Western family.